Set off on a whimsical adventure in search of your life's true calling. 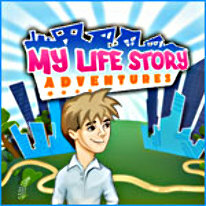 Set off on a whimsical adventure in search of your life’s true calling in My Life Story: Adventures. Haunted by dreams that you are wasting your life, you finally decide to take action. It’s time to dump your dead-end job, find a mentor and start working toward the life path of your dreams. Along the way, you’ll encounter colorful characters with unique problems that only you can solve. But to do so, you must learn special talents, solve unique puzzles, and scour the town for missing items. Complete these quests to unlock powerful skills, apartment upgrades, and even mystical meals. New challenges lurk around every corner, and only you can shape your path to greatness.